To improve medical treatment, researchers test new drug ingredients on biological cells. 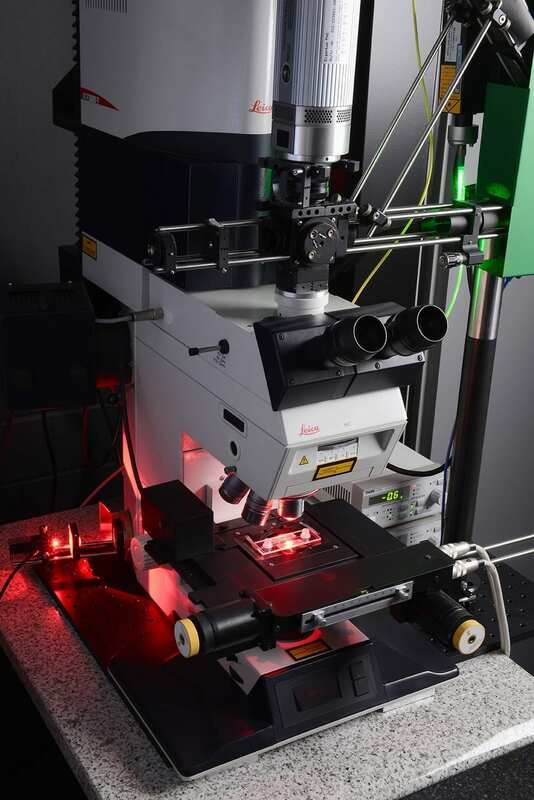 By combining two microscopy techniques, the time required for testing can be reduced by 50 to 80 percent. And far fewer measurements are needed. When developing new medications, biologists and pharma- cologists test different active ingredients and chemical compounds. The main purpose is to find out how biological cells react to these substances. To do so, researchers often use a fluorescence microscope that produces digital, holo- graphic images, i.e. computer-generated holograms in which the cells being studied can be viewed in three dimen- sions. The hologram is first created as an optical image, which is then digitized for recording and analysis on the computer. The computer calculates the data needed to display the three-dimensional image of the cells. This method has several advantages. The researchers don’t have to use markers to make the cells visible. They can examine the cells without touching them. And the cells can be characterized in vivo – scientists refer to this as in vivo testing. Researchers at the Fraunhofer Institute for Production Technology IPT in Aachen have found a solution to this problem. “It combines digital holographic microscopy with the use of optical tweezers,” reveals IPT group manager Stephan Stürwald. Optical tweezers are a special instrument that uses the force of a focused laser beam to trap and move micro- scopic objects. This tool enables the researchers to pick up selected cells, transfer them to individual wells of a microarray, and keep them trapped there. “By combining these two instruments, we can save between 50 and 80 percent of the time normally needed for such work, depending on the type of cell and the test method employed. That’s mainly because we don’t have to carry out so many repeated measurements,” explains Stürwald. The system is very easy to use, and the optical tweezers can also be controlled via the touchscreen of a tablet PC. April 16, 2019 - Insitro Lands Three-Year Deal With Gilead to Find New NASH Drugs XconomyDrug discovery startup Insitro burst onto the scene last year with ambitions of using machine learning techniques to find new therapies. Now the company.